I like to pack a few treats for passing around the campfire. 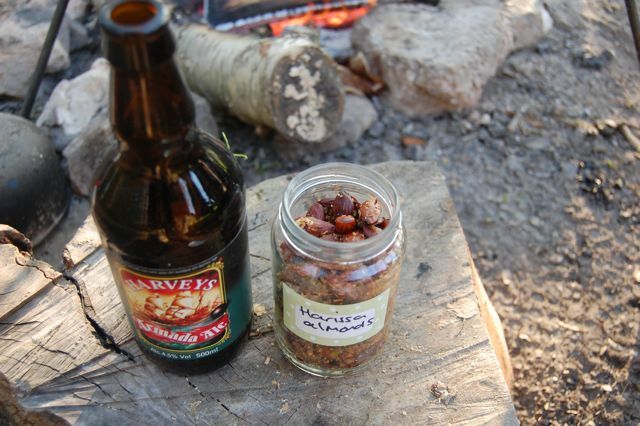 These harissa almonds go well with real ale and deliver three intense flavours – spice to match the heat of the fire, sweetness to satisfy the craving for energy that comes with living outdoors, and the saltiness of a good beer snack. Gently dry fry the cumin, coriander and caraway seeds until they release their fragrance. Crush in a pestle and mortar along with salt, pepper and chilli. Add the sugar. You can keep your spice mix in a sealed jar until you need to use it. Set the oven to cool (140oC, 275oF, Gas mark 1). Mix the almonds with 1 tablespoon of spice mix and 2 tablespoons of oil. Spread them evenly on a baking tray and cook for ten to fifteen minutes. Keep a close eye on them as sugar burns very easily. Once done, store the almonds in a sterilised jar and they’ll keep for a couple of weeks.